Interview with Los Angeles artist Lealani Ranch. LILA: When and why did you come to LA? LEALANI: I was born in Honolulu, Hawaii, but raised on Wonderland Avenue in the Hollywood Hills. Growing up in Los Angeles seemed bohemian and casual with many extravagant opportunities. Fortunately my sister and I were exposed to all forms of art by our parents who have always worked in creative fields. LILA: ‘Wonderland’ Avenue?!? Wow… I wonder how’s growing up in Wonderland ;). LEALANI: I’ve often heard people from other places say that people from LA were plastic and phony. I’ve never known this to be true. Even those who have reinvented themselves are genuine from the heart. I try to surround myself with friends who are accepting of obscurities because sometimes I am a bit odd and by all means, I welcome oddities. LILA: How’s your relationship with ‘Wonderland’ changed over the years? LEALANI: In the late 90s I was in my mid 20s and opened an art gallery that featured my paintings. When the gallery was not open I would go out on the town and party like a lunatic. I loved meeting new people and inviting them to see my art. The gallery was in West Hollywood but I lived in Venice Beach. Since then I have lived in NY and have traveled extensively. Now I find myself back in Venice and wouldn’t want to be anywhere else. I must say, as breathtaking as this world is, I feel like a guest everywhere except Los Angeles. Wherever I go, when I come back to LA, I am home. I do not go out nearly as much as I used to, though I still love meeting new people and sharing stories. LILA: Well, the connection to Hollywood is still strong, as you have contributed with one of your paintings to Billy Bob Thornton’s documentary on Willie Nelson that just premiered at SXSW. LEALANI: At one of my art shows where my High Art Calendar Collection was being shown, I had the great fortune of meeting legend Willie Nelson. In an instant I felt like we had always been friends. He was so easy to talk with, so kind and genuine. I was truly moved and grateful. A few months later, by mere coincidence, my fiancé got an editing job on a documentary about Willie directed by Billy Bob Thornton. 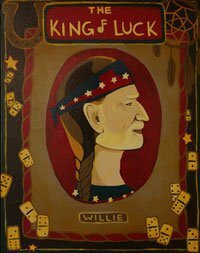 While this movie – The King of Luck – was being edited, I painted a tribute to Willie Nelson. I did not know if they would like it, but they did. I’m very happy about that. Any connection to someone that brilliant is an honor. LILA: The High Art Calendar Collection?!? Please, tell us more ;). LEALANI: In 2010 I had a close and personal glimpse of how stupid the prohibition law against cannabis is. Laws are supposed to keep people safe, not hurt them. 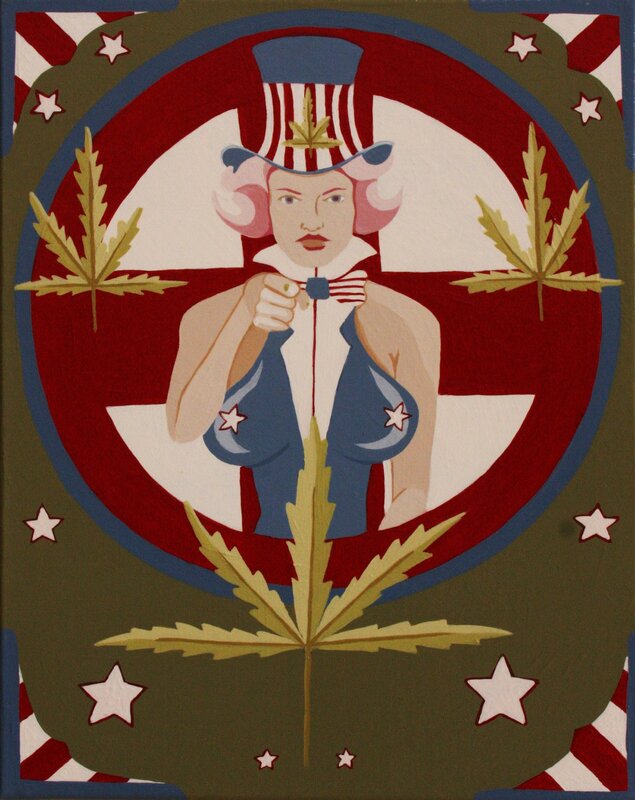 I wanted to make a mockery of the pot leaf symbol and present it with buxom women from all over the world. Each month of the calendar was filled with the past 5000 years of historical facts about cannabis, including its uses and reasons for being banned. Shirts, bags and other items were also printed with images from the calendar on them. I hope the greed based law changes soon so that people’s freedom will no longer be threatened because of their preferred method of medicating. LILA: How deeply does ‘Wonderland’ still influence your work? LEALANI: Los Angeles has a freakish subculture that allows artists to tap into their strangest thoughts and present them as art. I appreciate that. Los Angeles praises bad behavior rather than shun it. In some cases, it seems as though people try to out do each other with unusual behavior. For example, the paparazzi are drawn to celebrities who get into trouble more than the quieter ones because if it’s unusual, more people are interested in seeing it. It almost seems like a contest of who can out weird the rest the most. I do not feel like I am in a contest, I feel as though I’ve tried to fit in but have always found myself on the outskirts of the crowd. I’ve learned that restricting my imagination does not make for interesting art. Here in Los Angeles, the land of the obscure, it is acceptable to be yourself whether or not you fit in. After all, even the most traditional people can be quite strange. LILA: What about the Pregnancy paintings I saw in your studio a couple of months ago? Still working on them? LEALANI: Yes, I am. I have always been an obsessive person. This is not bad. Without obsession things would not get done. I find myself fixating on different topics. Today it is babies. Babies are silly and cute, this is one reason I keep painting them. Another is, as a woman of 38 years, I’ve traveled, loved, artied, laughed, cried… and now, I find myself deeply in love with my fiancé. The thought of making new life with him is something I shamelessly flaunt. Fortunately he feels the same way. LILA: My favorite piece of yours is Leda and the Swan. Tell me why, please :)…. LEALANI: Maybe because you can play with it? Leda and the Swan is one of my interactive sculpted paintings. I made it in 2001. With help from my father, an art director with an extensive workshop, I created a painting that can be scrambled and unscrambled by the viewer. It’s ever changing art. Another piece from the interactive collection is Multi-Woman, a 6’2” tower with spinning boxes that can be moved into 6036 different combinations. Both of these pieces were seen at the LACMA Muse show in 2002. I loved watching people play with them; they all seemed like happy children. I love making people smile like that.